Occurs only in Genesis (l. 11). 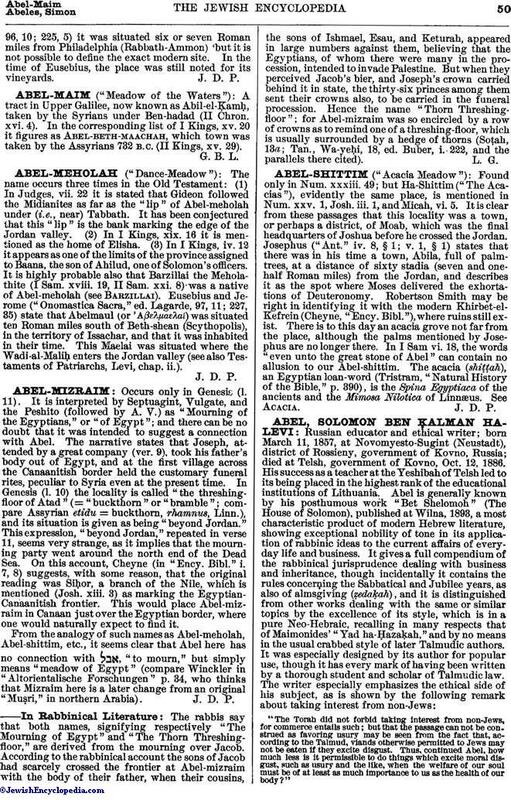 It is interpreted by Septuagint, Vulgate, and the Peshito (followed by A. V.) as "Mourning of the Egyptians," or "of Egypt"; and there can be no doubt that it was intended to suggest a connection with Abel. The narrative states that Joseph, attended by a great company (ver. 9), took his father's body out of Egypt, and at the first village across the Canaanitish border held the customary funeral rites, peculiar to Syria even at the present time. In Genesis (l. 10) the locality is called "the threshing-floor of Atad" (= "buckthorn" or "bramble"; compare Assyrian etidu = buckthorn, rhamnus, Linn. ), and its situation is given as being "beyond Jordan." This expression, "beyond Jordan," repeated in verse 11, seems very strange, as it implies that the mourning party went around the north end of the Dead Sea. On this account, Cheyne (in "Ency. Bibl." i. 7, 8) suggests, with some reason, that the original reading was Siḥor, a branch of the Nile, which is mentioned (Josh. xiii. 3) as marking the Egyptian-Canaanitish frontier. This would place Abel-mizraim in Canaan just over the Egyptian border, where one would naturally expect to find it. From the analogy of such names as Abel-meholah, Abel-shittim, etc., it seems clear that Abel here has no connection with , "to mourn," but simply means "meadow of Egypt" (compare Winckler in "Altorientalische Forschungen" p. 34, who thinks that Mizraim here is a later change from an original "Muṣri," in northern Arabia). The rabbis say that both names, signifying respectively "The Mourning of Egypt" and "The Thorn Threshing-floor," are derived from the mourning over Jacob. According to the rabbinical account the sons of Jacob had scarcely crossed the frontier at Abel-mizraim with the body of their father, when their cousins, the sons of Ishmael, Esau, and Keturah, appeared in large numbers against them, believing that the Egyptians, of whom there were many in the procession, intended to invade Palestine. But when they perceived Jacob's bier, and Joseph's crown carried behind it in state, the thirty-six princes among them sent their crowns also, to be carried in the funeral procession. Hence the name "Thorn Threshing-floor"; for Abel-mizraim was so encircled by a row of crowns as to remind one of a threshing-floor, which is usually surrounded by a hedge of thorns (Soṭah, 13a; Tan., Wa-yeḥi, 18, ed. Buber, i. 222, and the parallels there cited).